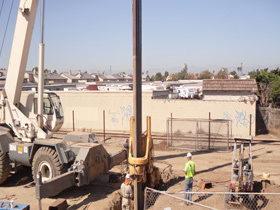 The project specified “No-vibration sheet piling” for the construction of two shafts used for a new lifting station in an area adjacent to existing 54” gas lines. In addition, there was restricted construction space and a difficult subgrade condition which consisted of a very dense clay layer, a high water table, and unpredictable obstructions (old pipe, old road, etc.). The installation of temporary sheet pile shafts using the SCZ675SM, with the Crush system, succeeded without any disruption. 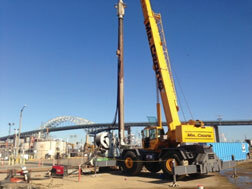 This is the first project constructed by Zefiro in the Port of Long Beach using the Silent Piler and Press-in method. The project is still under construction. 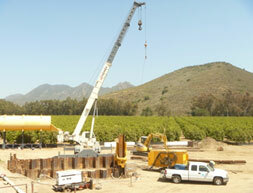 The project required the construction of two shafts to install new sewer pipe with a micro tunneling machine. The shafts needed to be constructed adjacent to existing water lines, electric power lines, and telephone cables. The installation of a temporary shaft using the UP150 and pre-augering the soil, succeeded without issue. 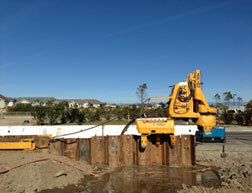 This is the third project constructed by Zefiro in the City of Oxnard using our Silent Piler. The project consisted of the construction of two shafts to install a new, 30” reclaimed water pipeline. 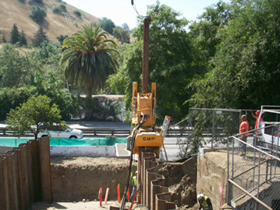 The shafts were installed using the Silent Piler due to the deteriorated condition of the existing Calleguas Creek levee. Additionally, there was a difficult subgrade condition which consisted of a very dense gravel layer and a high water table. The owner specified use of the no-vibration method, and the installation of temporary shoring with UP150, preaugering the soil, was successfully completed without any issues. 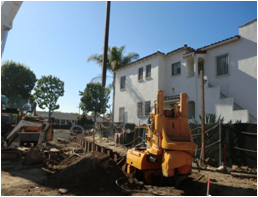 This project consisted of the construction of 2 open trenches to install a new, 98” sewer pipe. The project is located adjacent to an existing, old water pipe (12” away) and residential apartments. Additionally, there was a difficult subgrade condition which consisted of a very dense gravel layer and a high water table. The installation of temporary shoring using the UP150, pre-augering the soil, was successfully completed without any issues. The project requires the construction of two shafts and 200ft open cut to install a new, 98” sewer pipe using a micro tunneling machine. The shafts need to be installed adjacent to an existing, old water pipe (12” away) and residential apartments. There is a difficult sub soil condition which consists of a very dense layer of gravel and a high water table. The installation of a temporary shaft using the SCZ675WM with a 200GPM discharge water jetting system was successfully completed without any issues. The installation of 90” of sheet pile using the Press-in method was the longest in sheet pile driving history using the vibration free method. The temporary shafts, necessary to install the new sewer line, needed to be installed adjacent to existing water pipes and a public railway. The clearance between the water line and alignment was a mere 12”. Additionally, there was limited space for the service crane due to the proximity of the railway. The installation of a temporary cofferdam using the UP150 Silent Piler, the smallest Silent Piler in the USA, was successfully completed without issue. This is the first project constructed by Zefiro for the City of Port Hueneme, using the press-in method with the Silent Piler. The project requires the construction of 6 shafts to install a new, 66” sewer pipe using a micro tunneling machine. The shafts are to be constructed adjacent to an existing water pipe (12” away). 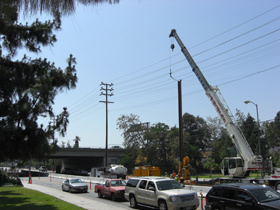 Additionally, there was limited overhead clearance due to a high voltage power line that crossed the shoring alignment. The temporary shaft was successfully installed using the UP150, pre-augering the soil and using the water jetting method. This is the first project constructed by Zefiro for the Department of Water and Power using the Press-in method with the UP150 Silent Piler. The project is still under construction. The temporary cofferdam necessary to install new sewer needed to be installed adjacent to an existing, old water pipe. The clearance between the alignment and the water line was 10”. Additionally, there was limited access for the service crane and difficult soil conditions were encountered. 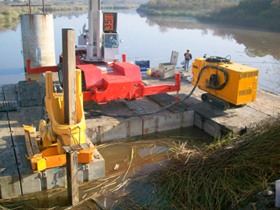 The installation of the temporary cofferdam using the UP150 Silent Piler, the smallest Silent Piler machine in the USA, was completed successfully without issue. This is the first project constructed by Zefiro for the City of Los Angeles using the Press-in method with the UP150 Silent Piler. 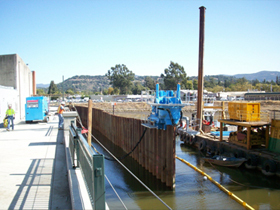 The temporary cofferdam, which was installed to cut off water for shaft excavation, needed to be removed due to its proximity adjacent to the old boathouse which has been rehabilitated by BBI construction. Additionally, there was limited water way access for the service crane. The removal of the temporary cofferdam using the UP150 Silent Piler was successfully completed without any issues. This is the first project constructed by Zefiro for the City of Oakland using the Press-in method with the UP150 Silent Piler. 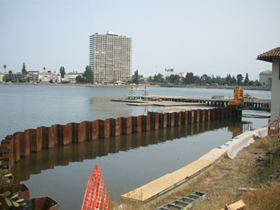 The cofferdam in Lake Calavera required to be dewatered for the installation of a new drain. In addition to difficult soil condition, there was no access for the service crane. Surrounded by residential buildings, noise and vibration were not allowed. Press-in method achieved this project in an environmentally friendly manner. 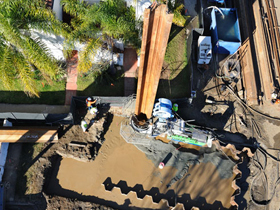 The piling project site was in near proximity to the Napa River Inn Hotel, which consisted of some old buildings and filled with guests all throughout the year. Therefore, noise and vibration were not allowd. Futhermore, there was no access for the service crane in water. To overcome these hardships, the Press-in piling method was selected.